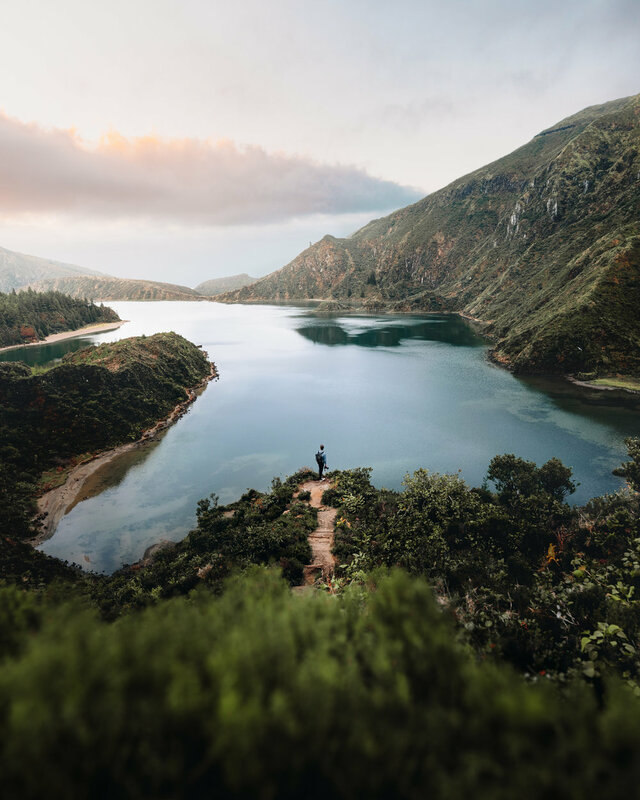 Back in February of 2018, @malthezimakoff and I had the opportunity to visit and explore the island of São Miguel, a small Portuguese island in the atlantic ocean, located a little north of the Canary Islands. These small Portguese islands are known for their lush and dramatic nature, much like their nearby cousin of Madeira. We only had the time to visit the biggest island of the group, São Miguel, the island with the largest city and capital, called Ponta Delgada, which was where we stayed. We stayed at the Vila Nova Hotel, a nice three star hotel, close to the water and city center, a great place to have as a base to explore the island. The first viewpoint on our list, was this place, called Miradouro da Boca do Inferno, sometimes also called Grota do Inferno. It can be quite tricky to find as it is located in the opposite direction of the starting point another popular hike on the island. Starting the short hike, you have to walk through a gate towards what just looks like a forest path, it even looks a bit like private property. Walking down this forest road felt really weird as it didn’t seem like a lookout like this would be anywhere nearby. Finally a sign to the left appears with the famous “Miradouro” word. Following this sign up a steep path, the landscape will open up with two beautiful lakes at the bottom, surrounded by volcanic hills. As we made our way up, more & more of the landscape revealed itself and it was simply stunning. The hike is fairly easy, and only takes around 20-30 minutes. The final little climb up to this viewpoint is up a few muddy stone steps, but it should be accessible for almost anyone. We visited the place for sunset, which had the sunlight was in on the left hand side of the mountain, which gave a beautiful glow to the entire landscape. I’d highly recommend visiting for either sunrise or sunset, especially to experience it less crowded as well. There were probably 10-15 other people there along with us for sunset. Beyond the main viewpoint of the path down the central hill, at the bottom, we went out on the small little area beyond the fence. As far as we could tell, this is not illegal, but it is obviously not recommended, hence the fence, so do this at your own risk, but it allowed for a great view of the crater lake, and a beautiful central composition for a photo. This place is THE must-visit location on the island, and is one of the most beautiful places I’ve seen in Europe. An extremely unique landscape, and easily accessible when you know how to find it. The next spot on our trip was the gorgeous and lush lake of fire, in Portuguese - Lagoa do Fogo. This place was about a 30 minute drive from our hotel, and we visited early in the morning for sunrise. We weren’t that lucky with the weather, it was very cloudy and foggy for the most of our visit, and it only cleared up a tiny bit. The hike down to the bottom of the lake took us about 40 minutes. It’s quite uneven, slippery and muddy, I think it’d rained the night before. Not the best or most well-kept hike I’ve been on, but for the avid or novice hiker, it should still be absolutely fine, just watch your feet for loose rocks. There loads of short little stops you can make on the way down for cool little photos, but it is hard to capture the beauty of it, it is absolutely beautiful in person. All of the mountains are clad in lush green vegetation and it really makes for some spectacular scenery. I might recommend going in the afternoon instead of early in the morning, as this place is located up in the mountains of the island, which is often foggy in the morning as the clouds cover up the peaks during the night. Although, if you want it all to yourself, we didn’t meet a single person during the hike for sunrise. It is well worth exploring this area for a while, as there are also hikes leading up towards the mountains for a viewpoint down upon the lake. Something I definitely want to explore if I get the chance to visit this place again. The start of the hike is easily accessible by car, and there is a small little parking lot on the side of the road just at the start of the hike down. Our final stop on the trip was a place called Parque Natural da Ribeira dos Caldeiroes, also sometimes referred to as the waterfall in Nordeste (region of the island). We didn’t know much about this place before visiting, but it served a nice little gem that was very easy to find. The parking lot is right next to the entrance to the park, and the waterfall is instantly visible. There is no fee (at least not at that time of year), the parking is free, and there weren’t too many people late in the afternoon. There are small paths leading up the hills, and there are multiple other small streams and waterfalls, but since we were short on time, we primarily stayed at the big one to get some photos before the light disappeared. The path ends with the view of the waterfall from where the photo was taken, but we decided to walk out onto the little bridge to get as close as possible, hence why we were shirtless, as we were getting soaked by the spray from the falls. It’s great fun to get all the way over next to the fall, but beware of the slippery rocks, and the fact that you’ll get quite soaked. This place was a great little visit for some smaller scale and easily accessible nature, perfect for an afternoon adventure. Thank you for reading! I’m working on creating more of these posts as I travel in hopes of inspiring you to visit these places, or helping you find some of these spots. My main goal with sharing my images and videos is to hopefully inspire others to go out and experience these places for themselves. Make sure to follow along on Instagram as this is where I share most of my work as well as everything else - @danielsjensen.